Both the attribution and the execution date for the portrait of William Cuthbert Blackett (b.1859) were unknown. However a conclusion was reached fairly swiftly with the help of ancestry expert, Paul Kettlewell. Kettlewell found a newspaper article from the Sunderland Daily Echo dated 26th September 1935 that mentioned the portrait when talking about the gifts Blackett left in his will. The article states that the artist of the work is Ralph Hedley. Public contributor Anthony Lester agreed that the painting is in the style of Ralph Hedley (1843–1913), RBA. 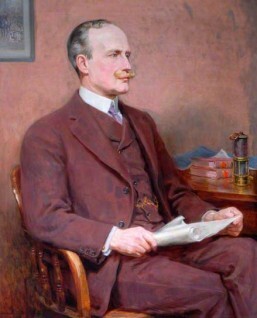 Osmund Bullock noted stylistic similarities to other works by Hedley on Your Paintings, such as the 1912 portrait of the former Master of University College Durham, and pointed out that Blackett lived only 15 miles away from Hedley. Group Leader for North East England: Artists and Subjects, John Millard, confirmed that the work of Blackett is most likely to be a late work by Ralph Hedley. John Millard drew a comparison to Hedley’s portrait of Alderman John Robert Lawson of South Shields, also on Your Paintings. The collection agreed that the work is by Hedley and the execution date was likely to be 1908–1912. When was this portrait of W. C. Blackett painted and who was the artist?